I have experimented with painting the handles of cutlery in the past, it was fun, if a little time consuming. When I saw paint-dipped wooden spoons in a fancy shop last week selling for £10 EACH I felt it was time for another batch. This time I thought harder about the pallette I wanted, used large wooden implements instead of cutlery, and, crucially, dipped, instead of brushed. Picking up wooden spoons from a charity shop in order to use them in your own kitchen isn’t just for the brave of heart. There is no need to be cowed by someone else’s bolognaise sauce stains. Let me hold your hand while we deal to someone elses food remnants. Test tube or something a similar size you can dip into. 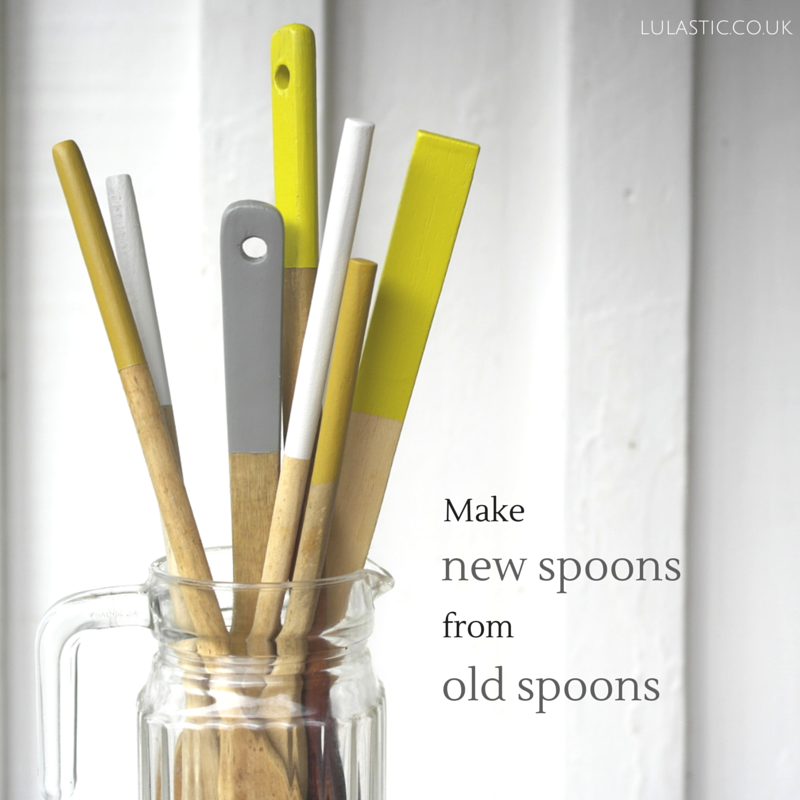 Start by giving all the spoons a soak and a wash. If only for your state of mind. When they are dry again giving them a good sanding. You should be able to get down to a fresh layer of wooden. You can also rub out any digs and splinters. After a rub down they will look almost new! Smear some olive oil over them – this oil will just stain them enough to bring out their natural colours. Don’t they look beauty?! Now mix up your colours and fill a test tube with your paint. (I used one of those thin plastic tubes that an orchid stem came in.) 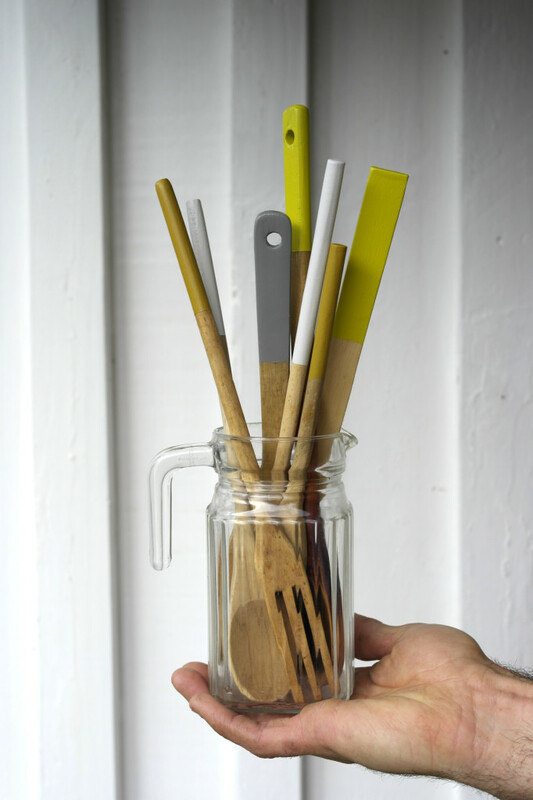 Dip your handle in then peg it on a line to dry. Once it is mostly dry dip again. I did three dips and was really happy with it. Taping the cut off point: You can also add tape around where you want your paint to stop. I did this on some, but be really careful about taking your tape off. The paint will be so thick that it might peel off a little bit with your paint. I kind of like the diagonal edge of not using tape. Yeah, so anyway, family and friends. You’ll be getting some spoons for Christmas. Oh yeah! An *excellent* present idea – esp as you could tailor colours for people. i have been keeping my eyes open at the thrifts for some time now for wooden utensils for just this project… but, of course, now that i am looking they are nowhere while before they were, quite literally, a dime a dozen. lol. thank you for the sanding and oiling tips! p.s. the wooden spoons i got crafty with in the past now serve as lovely plant “sticks” for the climbers. so cute! Thanks for the tutorial, I really love the colours you’ve used. Could I ask what kind of paint you used? I worry about it melting when it’s near the hob, or not being safe to be around food. Many thanks, and keep up the fab work.